Southern Adventist University went under a campus wide lockdown Thursday afternoon in response to a "percieved threat" by a former student. The lockdown lasted approximately 2 hours as police flooded the administration building and men's dormitory. The Greater Collegedale School System also went under lockdown, according to the Georgia-Cumberland Conference of Seventh-day Adventists. After the lockdown was lifted, the university released a statement saying that a former Southern student made a threat over delayed paperwork. The university was alerted to this threat by Chattanooga State Community College officials, the statement said. The university said Collegedale police located the former student off campus and was brought in for questioning. According to a report by Adventist News Network, this individual "had not attended Southern for several years." "This is not a test. We have executed a Campus wide lock down. 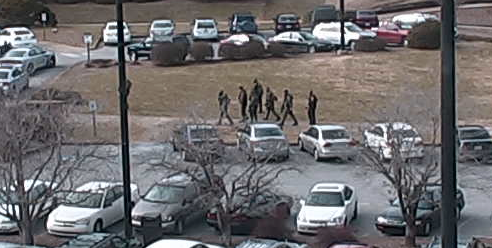 Campus Safety is investigating a potential threat. Please remain inside and away from windows. Please hold all phone calls. We will send more information as it is available. This is not a test." During the lockdown, university officials and city police did not publicly release information over the kind of threat the university faced, which led to a lot of speculation and assumptions by the public. Rumors of bomb threats, shootings and arrests quickly spread on Facebook and Twitter by students and local news media. Local news channels — heavily citing student Facebook posts — incorrectly published reports about gunfire, even though no shots were fired. Requests for prayer also spread through social networks. Sister universities across the North American Division gathered in prayer for the Collegedale, Tenn. school. Staff at the North American Division also paused to pray for the university. The university held a joint worship for students that evening to clear up any rumors and provide more information.